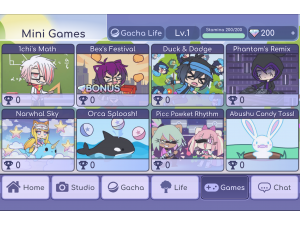 There are 8 mini games that you can play and they are a great way to pass the time while you are waiting for your stamina to replenish as they enable you to earn gems. Pay particular attention to the minigame that has the bonus icon as this one will reward you with extra gems. Below is a list of the 8 games along with a brief description about each of them. 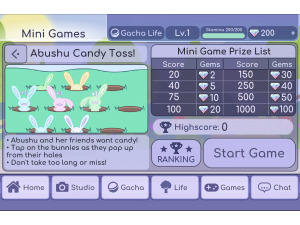 This minigame is basically the arcade game Whac-A-Mole Game but with bunnies instead of moles. The objective is to toss candy towards the bunnies whenever they pop out from the holes. You are given 3 lives and every time you miss a bunny you will lose one. 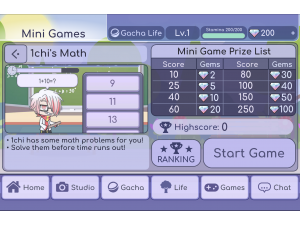 This minigame focuses on maths and will give you a series of arithmetic questions that you need to answer within a time limit. These questions will start off easy and progressively get harder. You are given 3 lives and each time you give a wrong answer you will lose one or if you fail to answer the question within the time limit. 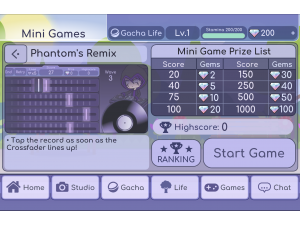 This minigame is all about rhythm. On the screen there are 6 coloured bars with notes falling down on each and the objective is to tap on the notes as they intersect with the rhythm line in order to score points. You are given 10 lives and you will lose one each time you miss a note. This minigame is all about dodging falling objects. You are given 3 lives and each time you get hit by an object you will lose one. 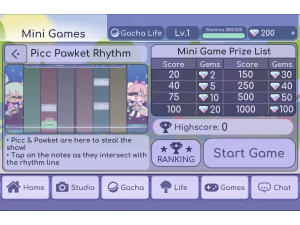 This minigame is music-themed and all about timing. The objective is to time your taps just as the crossfader lines up. If you tap too soon or too late it will register as a miss. The speed of the crossfader starts off slow and progressively speeds up. You are given 5 lives and you will lose one each time you miss. 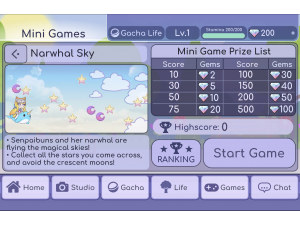 In this minigame you control Senpaibuns as she rides a Narwhal. 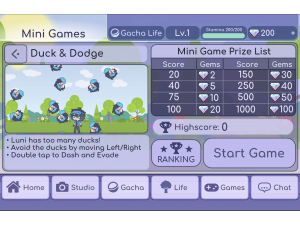 The objective of the minigame is to fly around picking up stars in order to earn points. You are given 3 lives and each time you hit the moon icons you will lose one. 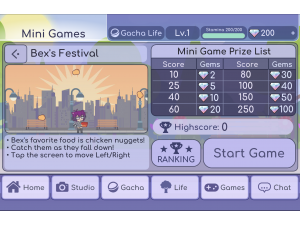 In this minigame you control a chicken named Bex and the objective is to catch the chicken nuggets that fall from the sky so you raise your score. It is not necessary to get the nuggets into the box, they just have to hit Bex for them to count towards your score. You are given 5 lives and each time a nugget hits the floor you will lose one. 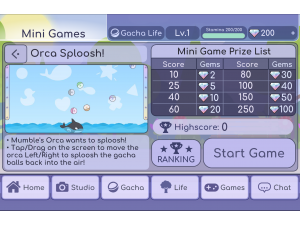 In this minigame you control an orca and the objective is to keep 6 balls out of the water by only moving from side to side using your body to block the balls. You can save the balls if they hit the water but if they sink to the bottom of the screen you will lose a life. You are given 10 lives.